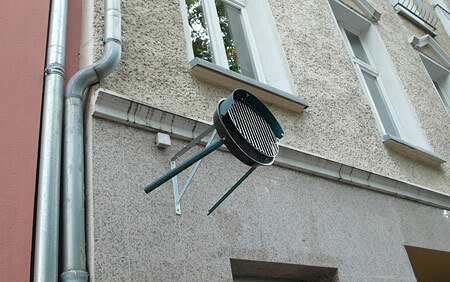 ”¦ a wall mounted barbecue. In fact, come to think of it, people with tiny apartments and very small kitchens could just store all of their kitchen utensils, plates, bowls and glasses, on the outside of the building. 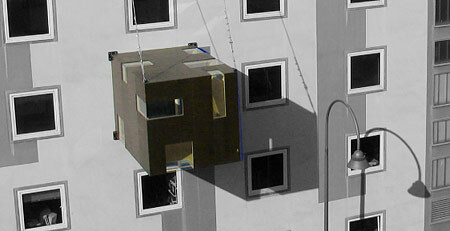 All you’d need is a securely fastened, weather-proof shelf, with access from the inside of the building. If you had a nice collection of crockery, you could even glaze the shelves from the outside so that neighbors and passers by can appreciate your impecable taste. 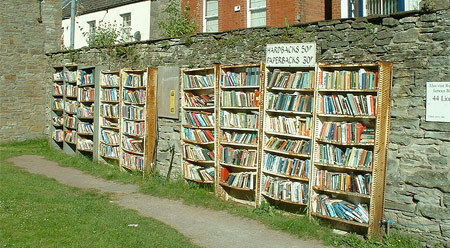 A cursory image search for “outdoor shelving” reveals little of real interest, but did remind me of the Welsh book village, Hay-on-Wye, where outdoor shelving isn’t uncommon.